The word Mesopotamia comes from Greek words meaning "land between the rivers." The rivers are the Tigris and Euphrates. The first settlers to this region did not speak Greek, it was only thousands of years later that the Greek-speaking Alexander the Great, King of Macedonia, conquered this land and carried with him his culture. Mesopotamia is considered the cradle, or beginning, of civilization. Here large cities lined the rivers and many advances took place. Mesopotamia is located in Southwest Asia. The first known civilization started there. A civilization is a group of people who have a high level of culture and order. People in a civilization belong to different social classes and do different types of jobs. A civilization has science and the arts. It also has a government, values, and beliefs. Mesopotamia at first glance does not look like an ideal place for a civilization to flourish. It is hot and very dry. There is very little rainfall in Lower Mesopotamia. However, snow, melting in the mountains at the source of these two rivers, created an annual flooding. The flooding deposited silt, which is fertile, rich, soil, on the banks of the rivers every year. This is why Mesopotamia is part of the fertile crescent, an area of land in the Middle East that is rich in fertile soil and crescent-shaped. Lower Mesopotamia is located the modern country of Iraq, while Upper Mesopotamia is in Syria and Turkey. The Sumerians were the first people to migrate to Mesopotamia, they created a great civilization. Beginning around 5,500 years ago, the Sumerians built cities along the rivers in Lower Mesopotamia, specialized, cooperated, and made many advances in technology. The wheel, plow, and writing (a system which we call cuneiform) are examples of their achievements. The farmers in Sumer created levees to hold back the floods from their fields and cut canals to channel river water to the fields. The use of levees and canals is called irrigation, another Sumerian invention. Farmers in Mesopotamia got water from the Tigris and Euphrates Rivers. Sometimes, though, it rained too much. This caused the rivers to flood. A flood is when water overflows from a river onto land. Floods could destroy crops, but they also left the land covered with silt. Silt is a rich soil. It is good for farming. By using irrigation, farmers could grow large amounts of food. The people of Mesopotamia had extra food, or a surplus. As a result, not everyone needed to farm. Some people could become artisans. An artisan is a person who makes a good, such as cloth, tools, or weapons. Soon people began to live together in places that helped them trade goods. Before long, small villages grew into cities. By 3000 B.C., many cities had started and grown in Sumer. Sumer is the region in southern Mesopotamia. The people of Sumer were called Sumerians. They built many cities. The cities of Sumer had deserts around them. Deserts were hard to travel across. As a result, each city stood alone. As cities grew, they gained control of the land around them. In this way, they formed city-states. Each city-state had its own government. It was not part of a larger nation. Historians believe that each city-state was surrounded by a large wall. Sometimes Sumerian city-states fought each other for control of the river water, a valuable resource. Each city-state needed an army to protect itself from its neighbors; however, during times of peace, they traded with each other. The Sumerian people had a common language and they worshiped many gods. This type of belief is called polytheism. Each city-state, though, claimed one god as its own. To honor this god, the city-state built a large temple called a ziggurat, a large pyramid-shaped building with a temple at the top, dedicated to a Sumerian deity. A temple is a building used to worship a god or many gods. A typical Sumerian city-state, notice the ziggurat, the tallest building in the city. People in Sumer were divided into social classes. The upper class included kings, priests, warriors, and government workers. People in this class were powerful and wealthy. The middle class had farmers, fishers, and artisans. It was the largest group. Enslaved people made up the lowest class. They had no money and no power. scribe is a person who records business dealings and important events. poem that tells the story of a hero. The Sumerians made many useful inventions. An invention is something new that is made. The Sumerians were the first people to use the wheel. They were also the first to use sailboats and wooden plows. In addition, they were the first to make bronze out of copper and tin. The Sumerians studied mathematics and astronomy. Astronomy is the study of planets, stars, and other objects in space. By watching the position of the stars they learned the best times to plant crops. Watch the video clip below from Discovery Education, as Nissaba, a young Sumerian girl, talks about her people's accomplishments. In 1922, English archaeologist, C. Leonard Woolley went to Southern Iraq in hopes of finding the Sumerian city-state of Ur. Woolley learned archaeology from some of the best of his day, and now he was ready to strike off on his own. Many people felt that Ur was only a myth, but Woolley, the son of a clergyman, was fascinated by the stories his father told about Ur, which, according to the Bible, was the birth place of Abraham. Abraham is a central figure of Judaism, Christianity, and Islam, three monotheistic religions. Woolley decided to excavate near the ruins of a ziggurat and began to dig two trenches. Here, Woolley confirmed that the site was the ancient Sumerian city-state of Ur. Woolley's discovery of Ur along with the artifacts and burials there give us a glimpse of life in Sumer 4,500 years ago. Woolley discovered graves of common people, but also royal graves, including that of a Sumerian queen named Pu-Abi. Around 2,300 BC, the independent city-states of Sumer were conquered by a man called Sargon the Great of Akkad, who had once ruled the city-state of Kish. Sargon was an Akkadian, a Semitic group of desert nomads who eventually settled in Mesopotamia just north of Sumer. The Sumerian king, Lugal-Zaggisi, tried to form a coalition of Sumerian city-states against Sargon, but he was defeated by the Akkadian. Sargon is considered the first empire builder. Sargon made Agade the capital city of his empire. Sargon's daughter, Enheduanna, was first world's first credited author because she signed her name to a set of poems she wrote about her gods and goddesses. Sargon's son and grandson ruled after him, but eventually the Akkadian Empire fell, and was replaced by the Old Babylonian Empire. 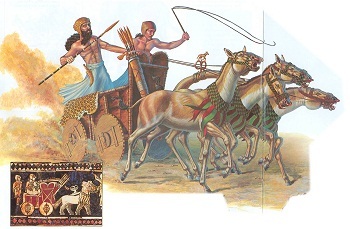 Sargon was an excellent commander, he organized his army into different units, including donkey-drawn war chariots, used to scare and trample his enemies. The Akkadian Empire stretched across all of Mesopotamia. 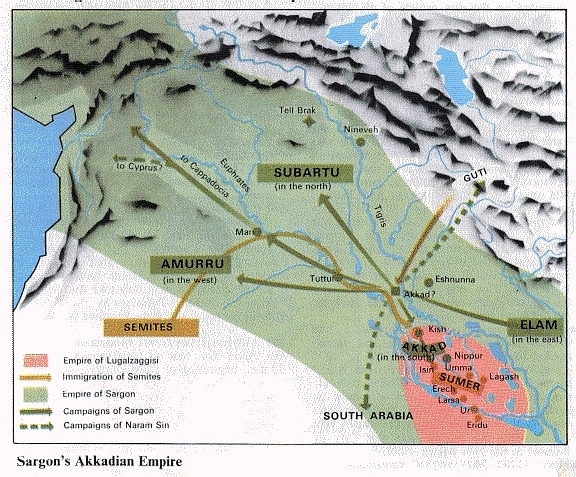 You can see the military campaigns of both Sargon, and his grandson, Naram Sin. Woolley called this artifact "The Ram in the Thicket." It was found in the Royal Tombs of Ur, and it reminded Woolley of a ram in a story about Abraham. It is now located on display in the British Museum. It is made from gold leaf, copper, shell, red limestone, and lapis lazuli. Sadly, the Sumerians didn't spend enough time or money on weapons and defense. They were conquered by Sargon and his people, the Akkadians.